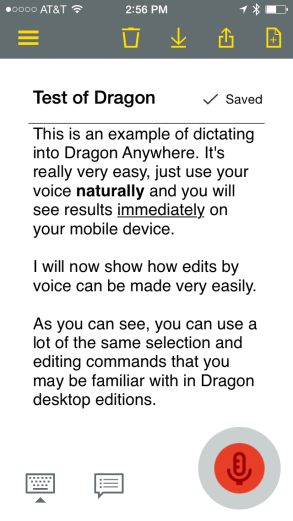 Nuance Dragon Anywhere now available for iOS. Nuance Communications today announced the availability of Dragon Anywhere for iOS mobile devices. 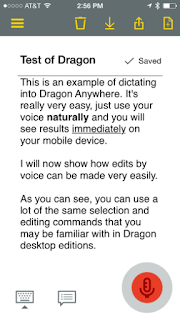 Already available for Android devices, Dragon Anywhere offers continuous, cloud-based dictation - no time or length limits - robust voice formatting and editing, and synchronization of custom features with supported Dragon software for PCs and Macs. Ideal for field workers, lawyers, social workers, public safety officers, and other professionals who often work outside of an office, Dragon Anywhere allows full documents to be composed, edited, formatted, and distributed via voice, directly from a mobile device. Completed or drafted documents can be shared via email, a cloud-sharing service like Dropbox, or as a note through Evernote, all by voice. Dragon Anywhere offers individuals who need to document and report on-the-go simple ways to continue working, while synchronizing custom words and auto-text commands with desktop devices running Nuance's Dragon software. Workers who often dictate specialized words, phrases, and customer and product names specific to their business will have the ability to add customized terminology on all of their supported devices, be it a PC, a Mac or an iOS or Android device. + Dragon Anywhere is available as a subscription service in the United States and Canada on the Nuance online store, with multiple subscription options available, including a one-week free trial. Subscriptions range from $15 per month to $150 per year. + Once Dragon Anywhere is purchased through the Nuance online store, the app can be downloaded from the App Store. + Dragon Anywhere is currently available in US English and will be available in UK English and German on iOS and Android devices later this year. + Dragon Anywhere requires iOS 8.1 or higher (iPad 3+, iPhone 5+, iPad Mini 1+) or Android 4.4+ phones and tablets.